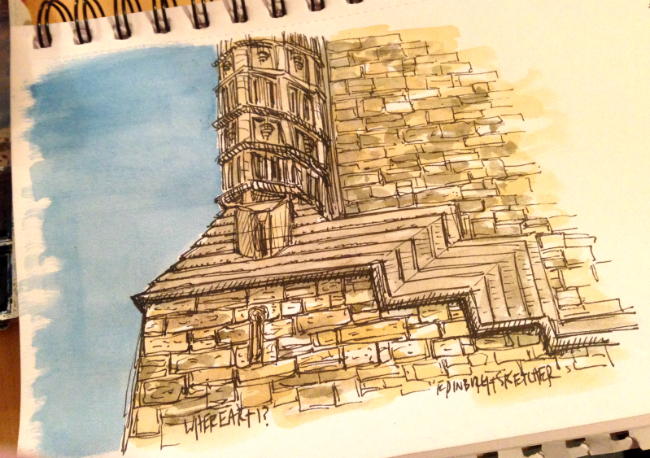 Can you name this Scottish location I’ve sketched? It’s an extreme close up of one of the nation’s iconic landmarks, but which one? 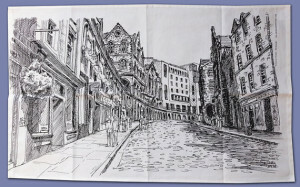 If you can you could win an Edinburgh Sketcher tea towel. I will pick a random winner this time tomorrow from the the correct answers. There are points on offer for the first three correct answers. Good luck every one! Keep an eye on the facebook and twitter throughout the day for clues if they are needed. Answer to come by this time tomorrow. This is a close up of the Wallace Monument near Stirling. Well done to those who got it, points went to @dunedinhen @CityCycling @brido187, and the Victoria Street Teatowel goes to @CityCycling, get in touch to arrange delivery. More Edinburgh WhereArtI next week and the Scotland version returns on May 2nd. I think this is the National Wallace Monument.